Seattle has over 90 unique neighborhoods. 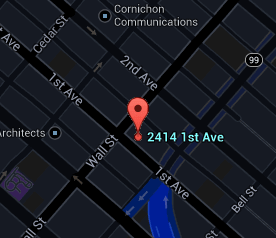 The location of Belltown Court is in the area known as Belltown. Macrina Bakery, Belltown Pizza and Belltown Billiards are just a few of the local digs in Belltown. There is so much to do and see around the neighborhood. One could spend hours discovering the Olympic Sculpture Park, Seattle Center and Myrtle Edwards Park. Of course it's easy to head west to the Piers along the Seattle Waterfront or south to Pike Place Market. Belltown is the epicenter of Seattle's restaurant scene, with exciting nightlife and cool shops. It's a great place to live, work or play. Belltown's got it all! Every building has its own personality and attributes. The community is an important aspect of city living and can have an impact on how integrated it is with the residences. The Belltown Court building features can be explored here. A full list of amenities within the complex is displayed to help understand the offerings of the project. Extending east from 1st to 2nd Avenue, and south from Battery to Wall, Belltown Court is the hub of the neighborhood. This 8 story 243 unit building is home to many ideal amenities one would never want to leave. The 3rd floor of the building wraps around a beautiful serene courtyard with walking paths, water features, and lush, mature foliage. The west building boasts indoor pool, hot tub and sauna. The east building is home to the community clubroom with full kitchen plus a fireplace, and a state of the art fitness center. Both buildings have rooftop decks. Secure lobby entries are located on both 1st Avenue and 2nd Avenue and there is secure parking and storage as well. All active, contingent, pending, and sold listings for the Belltown Court building. The Stroupe Group specializes in downtown Seattle condominiums. All the articles that have been published by the Stroupe Group concerning Belltown Court and Belltown can be found here.